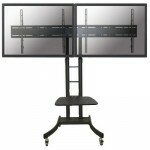 The NewStar floor stand, model PLASMA-M2000ED is a tiltable mobile floor stand for 2 flat screens up to 60â€. This mobile stand is a great choice for space saving placement or when wall-, ceiling mounting or desk placement is not an option. This cart stretches your investment by serving a variety of projection needs by sharing a large display over multiple rooms. Get optimal positioning for both standing and seated audiences, in any application, in any part of your location. NewStarsâ€™ unique tilt (20Â°) technology allows the mount to change to any viewing angle to fully benefit from the capabilities of the flat screen. The mount is manually height adjustable from 80 to 180 centimetres. A unique cable management conceals and routes cables from mount to flat screen. Hide your cables to keep the stand nice and tidy. NewStars' floor stand, PLASMA-M2000ED holds your TV, AV equipment and even hides your cables. The casters allow the stand to move it to where you need it. Easily roll this cart through doorways and over thresholds. NewStar PLASMA-M2000ED has one pivot point and is suitable for screens up to 60" (150 cm). 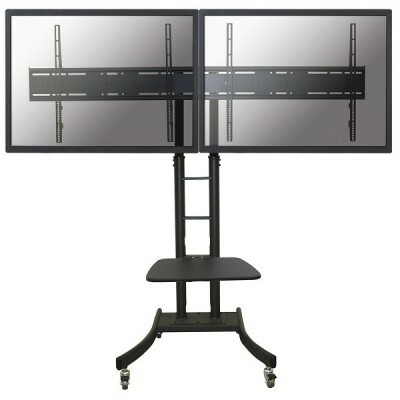 The weight capacity of this product is 62,5 kg each screen. The stand is suitable for screens that meet VESA hole pattern 200x200 to 800x600mm. Different hole patterns can be covered using NewStar VESA adapter plates. Speedy assembly and installation.